Today is National Entitlement Awareness Day, and the Eyres are sponsoring a HUGE Giveaway. Click HERE to learn more . . . and read on to hear how this book has already changed my family life. A few months ago, one of my children had the chance to attend a professional baseball game with my husband, and that particular child was really excited about getting cotton candy. My husband wanted to make the day extra special, so he bought a nice pink fluff of sugar from the vendor, and our child was all smiles–until the blue cotton candy cart came by. I don’t blame my child for wanting blue cotton candy. I don’t blame children at all for wanting the fun, beautiful, exciting things they see other people enjoying. However, too many parents today (including me, sometimes) aren’t taking the time to sit down and teach their children that they simply can’t have everything they want. Children need to learn to work. They need to feel a sense of ownership for their lives and motivation to do their best. 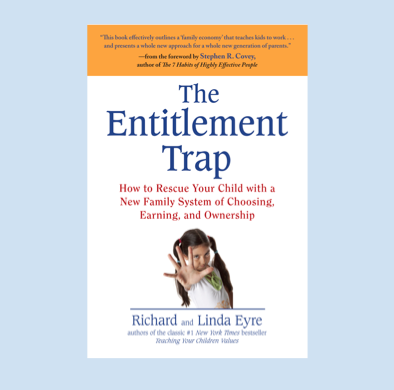 I've been working with Richard and Linda Eyre these past few months in preparation for the launch of their new book, The Entitlement Trap, and I must say that the principles they teach in their book WORK. My children did "Summer Goals" and had to work hard each day--learning to type, cleaning, reading, writing, helping their brother, practicing their musical instrument, developing new skills, etc. It's amazing to see how they don't gravitate to a screen as much now that they're excited about other hobbies and activities. We gave each child a small school shopping budget, but everything else they wanted had to come out of their own pockets. There was absolutely ZERO whining while we were clothes/school shopping (and each child was so grateful for the things they got to buy--even though they didn't get everything they would have typically wanted). My three-year-old does jobs around the house now in order to earn little check marks on our dry erase board. Ten checks equals a pack of gum, and he is excited to work. The other day, I was taking out the trash, and he said, "Mom, could I help you do that?" A THREE-YEAR-OLD. I was all smiles. I'm promoting The Entitlement Trap because this is something I truly believe in. There are more problems in the world than I am able to solve, but this is one cause that can help our children, our nation, and our world. It's already helping mine. Saren and I have been brainstorming a "Tip of the Day" idea for several months now. We have great new daily articles on The Power of Moms, but many of our readers have asked us to "spoon-feed" them with quick and simple tips. Every mom out there has tips to share, and we're going to start collecting them on our site. Here's our first one, scheduled to launch as soon as we can get this section together. My girls were so cute to help me with this, and Ethan took Spencer in the backyard to play when he got a little noisy. Do you have any ideas for a Tip of the Day? I'm over at Deseret News today with a post called "It's Not the Play-Doh I Love." Today is our LAST day of summer break, so we're off to play for a bit. (Why does school always start as soon as we get into a great summer routine?). It will be nice to have a little more quiet around here, but I've fallen in love with my children all over again, and I am already tearing up at the thought of them advancing to the next grade. This is one of those rites of motherhood I need to learn to savor. BlogHer 2011 - My First Time! This past Friday and Saturday, I took a trip down to San Diego to attend the 7th Annual BlogHer Conference, where 3600+ bloggers gathered for informative sessions, fabulous networking opportunities, delectable food, and a lot of fun. I've been hearing about this conference for years, but only recently have I felt like a part of the blogger crowd (something I never really intended, but which has become a happy stroke of serendipity). My mind is WHIRLING after all I've experienced, and I'm still playing catch-up from being gone, but I had to take a minute to record what I've learned and share just a tiny bit of the vision I've been privileged to see this weekend. I'll start with a few photos, share some of the main themes of the conference, and then I'll explain what I'm going to do as a result of this incredible time with BlogHer. This is the entry hall at the San Diego Convention Center. Heart beating fast. The Sails Pavillion where we gathered for mealtime (and even got to watch a flash mob that broke out during lunch). Friday evening, I joined several energetic, darling women who have been part of the ONE Mom Project, and we watched an advance copy of an ABC news clip that aired later that evening. It was a joy to meet Morra Aarons-Mele (left) and, of course, spend time with my dear friend (and BlogHer roommate!) Chrysula Winegar (right), whom I've only met once before, but who has become a treasure to me as we've worked on The Power of Moms together. 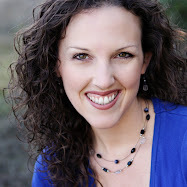 Chrysula is our Director of Social Media and Marketing, and we LOVE her! I also need to post a photo from my hotel window (it's kind of torture to be in such a beautiful place when you're spending all your time in artificially-lit conference rooms, so I soaked in as much as I could get). A huge highlight of my trip was meeting Stephanie Nielson, of Nie Nie Dialogues. I've been following her blog for years now, and she absolutely radiates love and beauty. There is so much I want to learn from her, and we're hoping she'll be able to keynote at a Power of Moms Retreat in the near future. 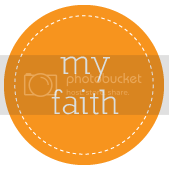 These photos only represent the very tip of the BlogHer iceberg, but hopefully they provided you with the basic idea. Now I'll move on to the main themes of the conference. (1) Blogging allows each of us to have a voice. BlogHer encourages women, particularly, to share their passions and perspectives, teach what they know, and enable their voices to match their influence. (2) Blogging fosters powerful conversations. There was a HUGE variety of interests represented at the conference--people blogging about pets, food, social issues, books, fashion, motherhood, politics, travel, entertainment . . . it was quite overwhelming, but what I loved was that there was no "wrong" topic. As each of us write about the topics most dear to our hearts, and as we engage respectfully in conversations with those who are different from us, we develop compassion and understanding, which flows into every other aspect of our lives. (3) Online communities can unite to create change in the world. I will NEVER underestimate the power of a group of committed individuals. Twitter, Facebook, and blogs might easily be lumped into the category of "mindless wastes of time," but not if they're used well. (4) Brands are very interested in working with bloggers to promote messages and products and receive feedback from their target markets. I spoke with representatives from some of the largest corporations in the world, and it was powerful to see how solid companies, well-connected bloggers, and some creativity can yield fantastic results. The people from King's Hawaiian bread were there, for example, with new packaging supporting breast cancer awareness. My children love these rolls, and were so excited that I brought some home. The Johnson and Johnson company recorded interviews with bloggers on how they are using social media to do social good. You can see mine here if you'd like. There were also dozens of fun booths set up, like the one by Hot Wheels that featured their new wall-mounted tracks. Brilliant. (5) Although the Internet is still a relatively new frontier, the tools we have available to us today make it simple to raise our voices online. (Right now I'm on my backyard swing, typing on an iPad while my boys wrestle on the trampoline.) It's not easy to balance all I am doing with the needs of my family, but I've never felt so compelled to do so. (1) Reach out. I don't want to spend my life on the computer, but I do want to invest some time and energy into building relationships with the amazing people out there. Wow, my eyes have opened. (2) Write as much as I can, as well as I can. I know not everyone wants to read what I write (and that's okay! ), but my commitment to families and motherhood can be a blessing to others, and I feel a responsibility to do my part. (3) Build Power of Moms' offerings. 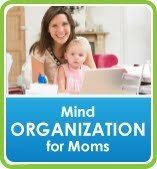 We are in an interesting spot at The Power of Moms because we are both a brand and a blog. Saren and I have huge plans to grow this organization, and while we won't put it before our families, we are doing everything we can to work smart so we can reach these goals and make a difference. I've written this blog post in bits and snatches, and now all my children are tucked in bed. I missed them terribly while I was gone, but now that I've told them all about BlogHer, they want to come with me as soon as they can. Alia and Grace, especially, are excited about building their blogs, and they want me to teach them everything I've learned. It's darling.